I’ve been making boxes from plastic canvas for about thirty years now. They are great fun to make, the 10-mesh plastic canvas is inexpensive and the main yarn I use is synthetic double-knitting yarn. The boxes are quick to complete, are very portable projects (once that canvas has been cut to size), and make great gifts. Thank you Sue for putting the instructions etc on here for your two beautiful boxes. I have just started doing Plastic canvas embroidery in the last 4 months – I would like to know – How do you leave the insides of your boxes so neat. 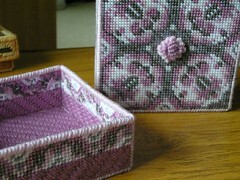 I really enjoy working with Plastic canvas, I am at the moment doing some tissue box covers with 7 hpi using Aran yarns. I have used patterns which I have had to send to America for, but they are quite old and old fashioned, but o.k. for starters. Where do you get your Plastic canvas from – I buy mine on line from Sew and so, they seem to be the cheapest, I cannot find any round Harrogate where I live. All the best, Gwen. Hi Gwen, I hope you’ll find the instructions helpful and inspiring. If you’re like me, you’ll have fun playing around and making up your own designs. It’s quite addictive, once you start! 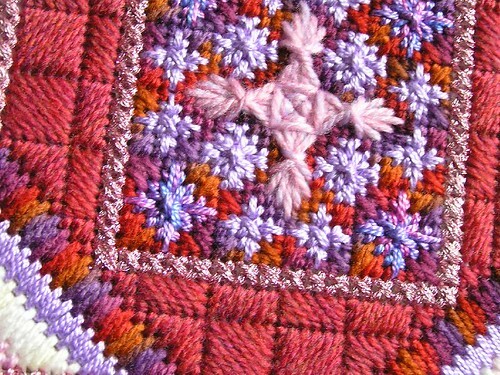 Neatness comes from chosing stitches that cover well on the inside of the box – the cushion stitch squares are brilliant for this – and also from running the start and the end of the yarn into the stitches as invisibly as possible. 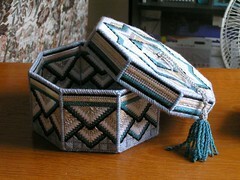 It is very easy to be neat with embroidery. I’m the world’s most messy and untidy person when it comes to everything else in life, so I get a buzz out of doing my embroidery as perfectly as I can. Plastic canvas seems to ‘come and go’ over the years – I try to keep a good stock in hand for the lean years. Sometimes it’s in lots of shops and on market stalls, and sometimes it’s almost impossible to track down. I use the #10 Darice, and my last batch came from Sew & Sew, too. They are a good firm to deal with. When I’m lucky, I can get it from a local wool shop where I buy a lot of my yarn. I do always try to find embroidery supplies locally, if I can, on principle. Too many embroidery shops are closing down these days. But the internet is very useful when all else fails! I’d love to see a picture of your boxes when they’re done. 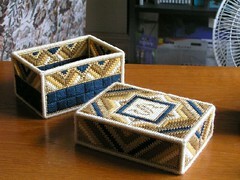 Hello, Gwen, Thank you for posting directions for the Chester and Shrewsbury boxes – they are outstanding! I live in Florida, and am currently working on my second Chester box – the first I made in size 7 plastic canvas since I couldn’t get the yarn through the size 10 – made it in colors similar to yours and love it. The only problem is that the bottom is smaller in relation to the top in this size. i am almost finished with the Chester box in size 10 mesh, which works up well using embroidery DMC floss (2 skeins per color). 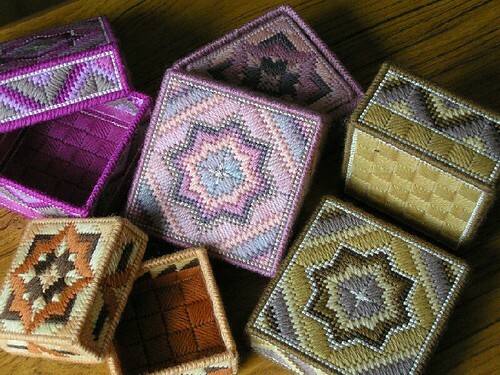 These boxes are being done to give to the church craft group for a church bazaar in November. The ladies love them, so I hope to make quite a few for them. I love your design sense. I’m glad you’re enjoying making the boxes for your bazaar, Estelle. The difference in size between the base and lid when using 7 mesh doesn’t surprise me. My usual ‘subtract four’ from the length and width of a lid to get a comfortable fit for the base depends on using 10 mesh and the thickness of acrylic DK yarn. One of the fun things with plastic canvaswork is adapting and altering designs, so you might like to think up a slightly smaller lid or a slightly larger base for 7 mesh – or take the plunge and invent your own 7-mesh box from scratch. I an not going to provide a pattern for the Brighton Box, Debra. It takes a fair bit of maths and working-out to make an 8-sided box, but if you enjoy a challenge, why not try designing your own?